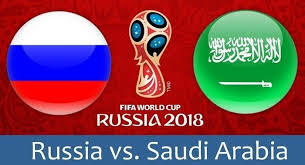 The 2018 World Cup kicks off on Thursday, June 14, 2018 with a Group A fixture between host nation Russia and Saudi Arabia at the Luzhniki Stadium in Moscow. It would be the only match for the day to coincide with the opening ceremony, with three group stage fixtures taking place each day until June 28. Russia qualified automatically as the host and will be making their fourth appearance at the finals since 1990. For the Asian Champions, Saudi Arabia, their best result at a World Cup was finishing in the last 16 in 1994. Here are all you need to know ahead of the clash between the two sides which kicks off at 4pm. In Nigeria, the match will shown on DSTV Supersports channels and GOTV sports channels. In the United Kingdom (UK), the game can be watched live on ITV or streamed live online using the ITV Player. Russia don’t have a standout players. So they will have to rely on the emerging talents of Aleksandr Golovin, who is their most dangerous attacking player and aged just 22. They have also included ex-Chelsea full-back Zhirkov who is s nearing the end of his international career. For the Saudi Arabians, they parade three key men in the likes of Al-Abed, Al-Muwall and Al-Shehri. Al-Abed scored five goals in the qualification stages and remains to be Saudi Arabia’s top-scorer en route to the finals.